We need more Americans to aspire to have higher education to be competitive in the world. The Republicans are continuing to go down the wrong path if one of their candidates is calling anyone who thinks that everyone should have a college education is a “snob”. This video combines two things I like- art and HBO’s Game of Thrones. It’s a time-lapse video of a portrait of Peter Dinklage who plays Tyrion Lannister. Unlike, Jeremy Lin and the New York Knicks, streaming games with the NBA League Pass on the Apple TV is not ready for “primetime”. For $109, I subscribed to the Choice package that allows you to follow five teams. It’s a decent deal, but unfortunately it turned out to be an exercise in frustration. The picture quality isn’t broadcast quality with lots of pixelation. But, the main issue is that the game constantly froze every few minutes, waiting to be buffered. The game is supposed to be live, but the video kept getting further and further behind. Occasionally, the game would completely hang forcing me to back out to the main menu. Re-selecting the game jumps you forward back to “live”, causing you to miss any action that happened in between. I have high speed internet- 20mbs cable and I haven’t had issues with streaming. On the internet, there are a lot of complaints about the NBA League Pass and the Apple TV that haven’t been resolved for months. I’m guessing it’s the NBA’s fault since it seems like there are problems with streaming to the Roku too. I don’t have high hopes that they’ll fix streaming before the end of this season so I canceled my subscription. It turns out that when you sign up for NBA League Pass you agree to their user terms which says no refunds, but they were able to refund my money since I wasn’t able to get it to work to my satisfaction. The ESPN editor fired Sunday for using “chink in the armor” in a headline about Knicks phenom Jeremy Lin said the racial slur never crossed his mind – and he was devastated when he realized his mistake. “This had nothing to do with me being cute or punny,” Anthony Federico told the Daily News. You kind of feel bad for someone who loses their job because of a mistake, but as an editor for ESPN, his job is to NOT make these types of mistakes. Asian-American sensation Jeremy Lin of the New York Knicks has arguably received more than his share of accolades in the past two weeks, bursting on the scene as an NBA star and gaining attention throughout the world. 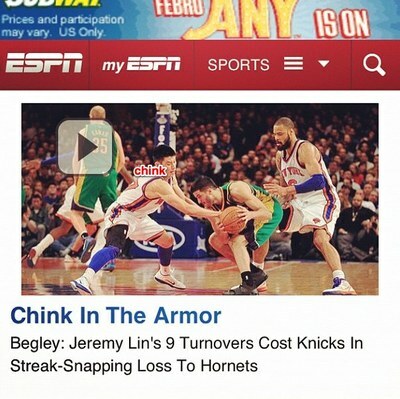 But after the New Orleans Hornets ended the New York’s seven-game winning streak, ESPN.com took a dig at Lin, using the headline “Chink in the Armor” on its mobile sites. The headline, accompanying a photo of Lin, was distributed to ESPN.com’s mobile users. “Chink” is the fighting word for any one of Taiwanese or Chinese decent. Unfortunately, it’s also one that I experienced most growing up. It’s absolutely shocking to me that it made it into a headline on ESPN. Apple’s 1999 Superbowl Ad. I have followed Apple since the Apple II and I have absolutely no recollection of this ad. NYTimes.com: From Ivy Halls to the Garden, Surprise Star Jolts the N.B.A. A story about Jeremy Lin, Taiwanese-American and the “surprise” star of the New York Knicks. It’s exciting to see a fellow Taiwanese-American break through in the NBA. Without an NBA team here in Cincinnati, the NBA season really didn’t begin for me until the playoffs. Now, with Jeremy Lin playing, I’ll be rooting for the Knicks and checking them out on TV when they’re on.